There are way too many ads on the Internet that will promise you a huge income with just a little effort from your side. If you expect an easy or a quick way to get rich, then I recommend you to stop reading this blog post any further. If something is too good to be true, then it usually is. If someone promises you on an advertisement banner a $300/hour income…You might want to ask yourself “Where can I sign-up?”..Well…joking aside. Exaggeration can be great on some ads, but sometimes it goes totally out of control, and some online ads goes more on a comic side. If the Internet would be a full of “making millions sitting at home” job opportunities that actually work, who would do a “normal work” anymore? Why would anyone send out and emails to strangers, if making money is so easy? I doubt that they would have to let strangers to know about these job opportunities… I’ll never seen a guy (or a girl) on real life that makes money purely online. Have you heard from a guy who lives just by his advertising revenues? Me neither…. if you have. I’m guessing you heard this from your online friend? Is it possible to make money online then? Yes it is. Just don’t set your expectations too high. You can make some pocket money by adding ads to your website. On this blog post, I’m only listing reliable and well known companies that has been online for years. And also from whom I have had first hand experience. Important! Before your sending your applications to these advertisers, make sure you have read their terms and conditions! 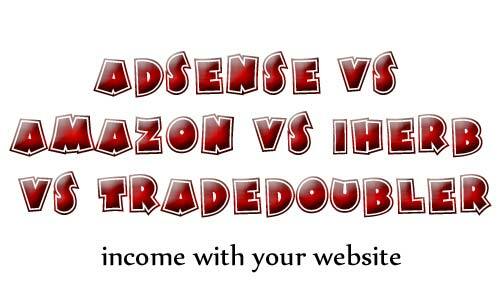 Adsense, Amazon Associates, iHerb and Tradedoubler – Best ways to get an extra income? One of biggest names in health product business. I order products regularly from iHerb, and I would recommend their products to my family and friends, even if I wouldn’t’ get a dime! It’s easier to recommend health products or any other products when you have actually used them. For the health food/superfood and other bloggers this is certainly the best way to make some extra money. If you have a large amount of friends on the social media, you should gain referrals rather easy. How the referral thing work with iHerb? How to get started with iHerb affiliate program? 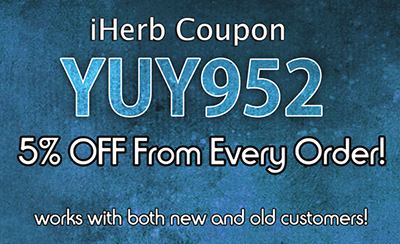 visit: www.iherb.com Make your first order with a coupon YUY952 and you will receive up to $10.00 discount. Once you have done your first order, you will then get your personal code that you can start to promote. + If you have many friends (also on Facebook and other social media), you should gain your first referrals pretty easily. + Multilevel commission. 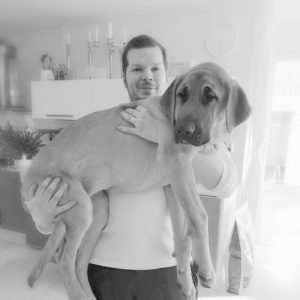 Commission is paid up to four sub-levels! + Ad-blockers won’t block your ads! + You can advertise on your website, discussion forum signatures, bulletin boards (gym, flea market etc..), give the coupon to your colleagues at work etc..
– Starting up can be hard, if you don’t have that many friends, or you don’t use social media. – Multi-level marketing has a bad reputation. – Jealousy. People doesn’t like links that have a referral code in it, even if there is nothing to lose. iHerb and other referral based services allows blogger and website owners to earn from their hard work. More about iHerb on my other blog post: 7 reasons why iHerb is my favourite affiliate network? Ad service provided by the Google. If you haven’t heard about Adsense before, this must be your first time on the Internet. Google Adsense works on both PPC (Pay-Per-Click) and impressions (PPV = Pay Per View). Google Adsense is easy to set up, and it’s a well known and trusted. Biggest flaw with the Google Adsense is it’s weakness against ad-blockers. – Ads can be blocked easily via Ad blocker add-ons and other software. With Amazon your earning are based on commission. Associates earn up to 10% in referral fees on all qualifying revenue made through their links. I’m also a regular buyer on both Amazon.com and Amazon.co.uk. I recommend their services to many of my friends. + More you sell, the higher the commission percentage will be. – If your country doesn’t have it’s “own Amazon”. It might be harder to get sales. Tradedoubler is a PPC and commission based. You should read the terms and conditions carefully, before applying for any of the advertisers. + PPC and commission based. – If your application gets rejected by the advertiser, it’s not possible to apply again to the same advertiser. Make sure your site is following the guideline set by the advertiser, before applying! – Ad-blocking software blocks image ads completely. – PPC amount set by some advertisers can be very low. Important! Before your sending your applications to any of these advertisers, make sure you have read their terms and conditions! Support this blog and buy your health products from iHerb.com, and get a 5 dollar discount from your first order by using coupon YUY952 – Try it, love it, share it.